SHIRAKAWA SEISAKUSHO has over 60 years of experience, with 10,000 units in over 40 countries. Based on this record, we continue to develop products that comply with our client’s needs for a brighter tomorrow by making a huge contribution to not only quality, safety, but efficiency, and the environment from the viewpoint of “air quality”. Shirakawa air dehumidifying equipment deliver a world of advantages. Working on the frontiers of technology, our engineers are developing innovative designs that will cut running costs and reduce noise while optimizing gas quality and energy efficiency for specifications tailored to fit your exact needs. 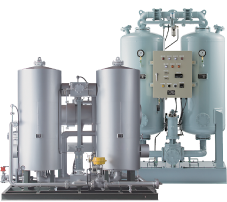 Adsorption air dehumidifying equipment, both open and closed cycle, employ either a heated or heatless regeneration system. We custom-engineer our air dehumidifying equipment to meet your specific application and installation requirements. Explore some of our innovative air dehumidifying equipment solutions.